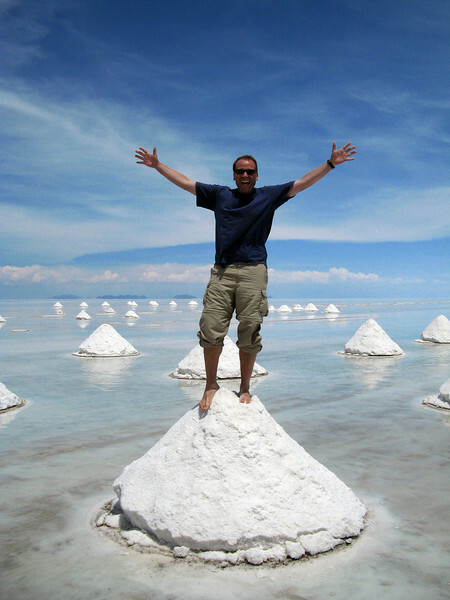 UYUNI, BOLIVIA – Got salt? 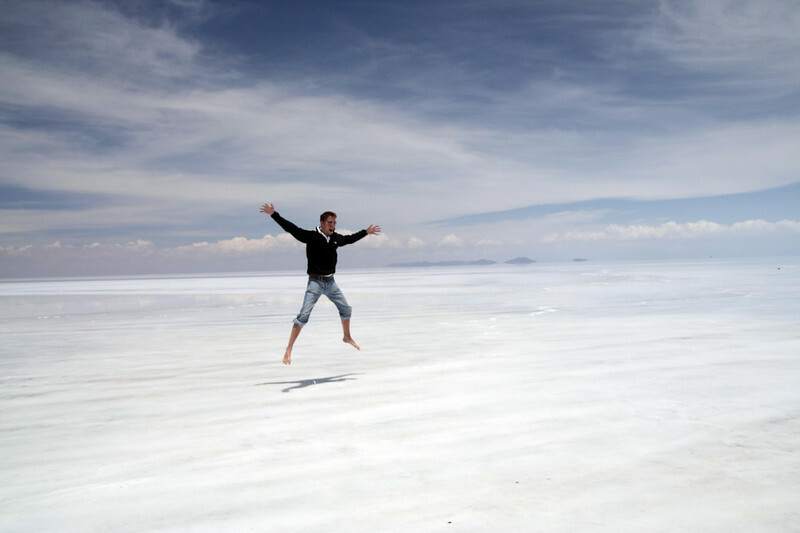 This is a photo of me standing on top of over 4,000 square miles of salt on the Salar de Uyuni in southwestern Bolivia. What the heck is a salar, you ask? It's basically a giant salt flat. 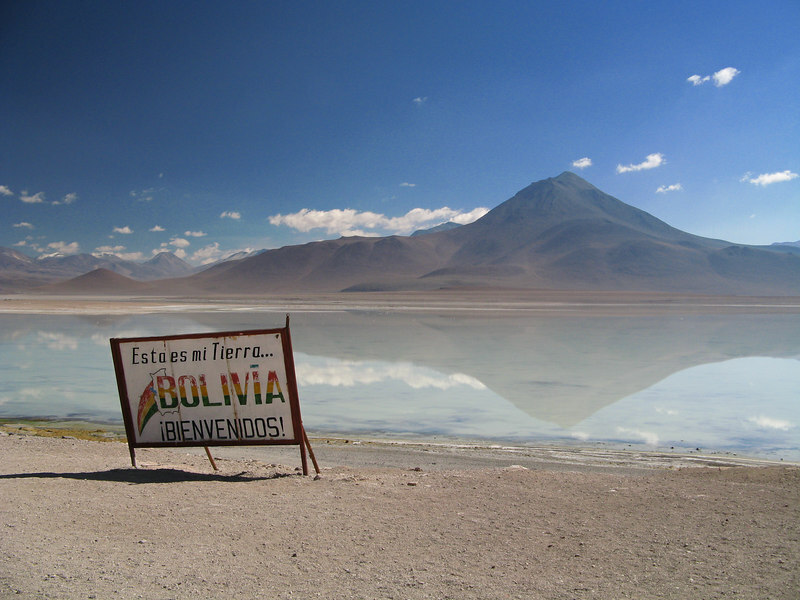 And this one, in Bolivia, is the largest in the world. It is the remains of a giant prehistoric salt lake which dried up and left all the salt behind, roughly 10 billion pounds of it. It is white, flat as a pancake, and stretches all the way to the horizon. Pretty wild stuff. My trip through this remote corner of Bolivia served two purposes: First, I couldn't pass up the chance to see some of the strangest landscapes in the world. Second, I needed to get from Bolivia to Chile and there are no roads within hundreds of miles; the only way to get there is to cross this high desert plateau (up to 4,500 m, or 14,700 ft.) in a 4WD vehicle. I usually hate organized tours, but short of laying out a lot of cash to hire a private vehicle it's the only way to cross the border, so I took the plunge. Our small group of six included travelers from Ireland, Australia, the U.K., and the U.S., along with our driver/guide, Gabriel, and a cook. Eight people, along with all of our gear and supplies, crammed into a less than reliable looking Toyota Land Cruiser and headed off into the desert. 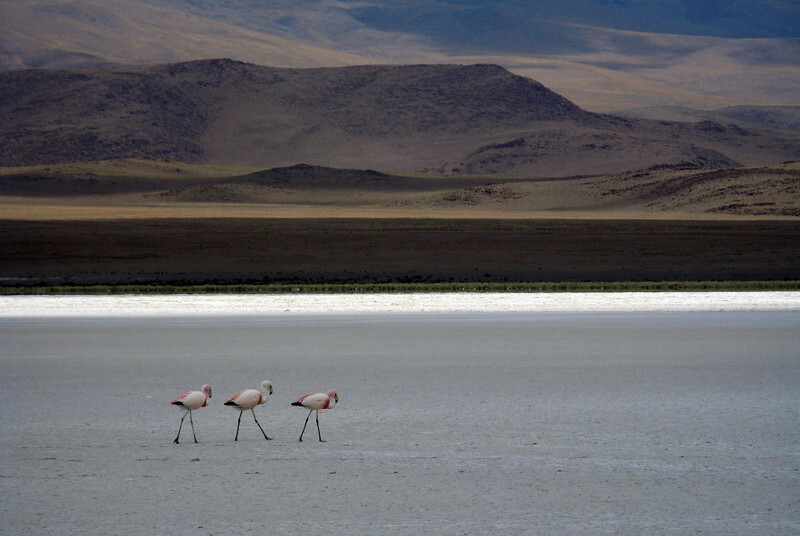 Depending on the time of year, the Salar de Uyuni takes on different forms. 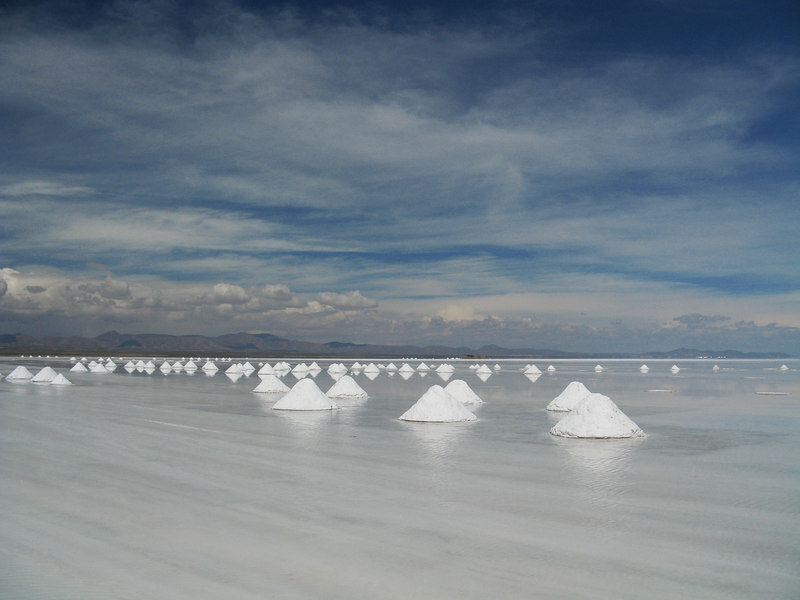 During the dry season it is a flat, cracked plateau of white salt. At the moment, however, it's the wet season and the surface is covered by just a few inches of water. 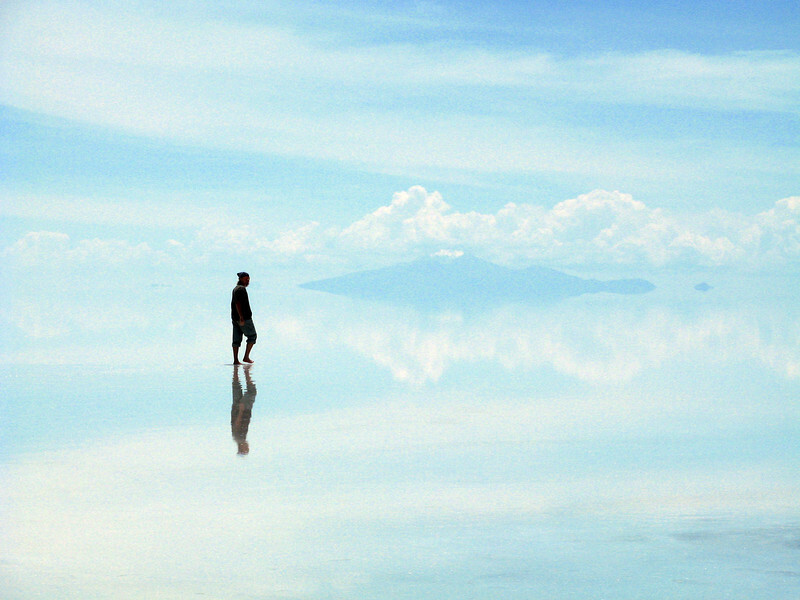 The resulting effect is that the entire surface of the salar turns into the the world's largest mirror, perfectly reflecting everything above the horizon in a mirror image below. It can actually be a bit disorienting. Gabriel steered our Land Cruiser straight into the water and proceeded to drive past cones of drying salt evenly spaced across the surface. The locals mine the salt, and during the wet season form it into these cones so that it can dry. As we discovered, they do all kinds of things with salt here. In some places the layer of salt is 30-40 feet thick, and they cut bricks from it like you would cut snow bricks for an igloo. Around the edge of the salar you see buildings constructed from giant white blocks. Somewhere in the middle of the salar, we pulled up at the Salt Hotel. And I mean that quite literally – it's a hotel built out of salt. The walls, the floor... everything is made from bricks of salt. Even the furniture is made from salt. Starting to get the idea? Rolling up our pant legs we cautiously stepped out and wandered around this strange, mind-warping landscape. This is one of those times when photos just don't do justice to a place. 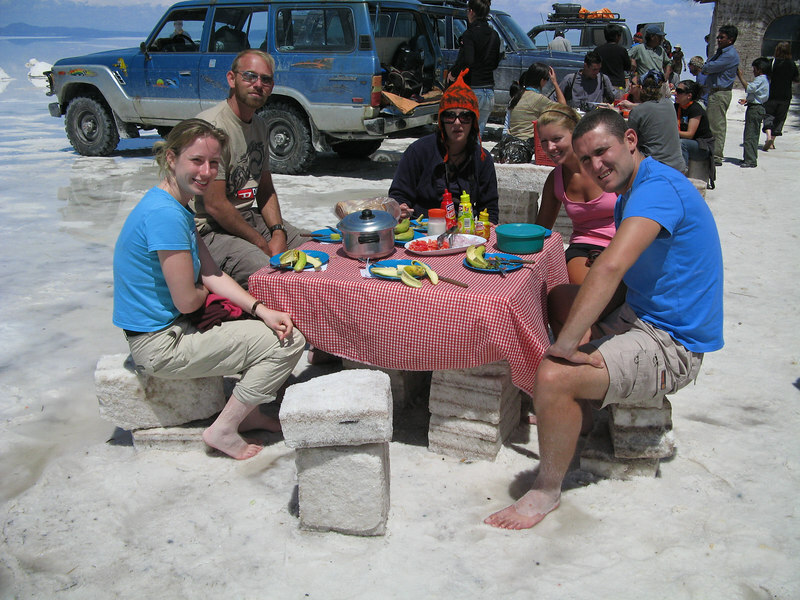 After wandering around for a while and eating lunch at – you guessed it – a table made of salt, we crammed into the Land Cruiser and headed for more remote locales. That night we stayed in a small, ramshackle hostel in a nearby village, the six of us crammed into a single room. It was on par with a lot of places I have stayed in remote areas of Bolivia, but just in case you haven't been here let me paint a mental picture for you. Everything looks like it is about to fall down. Bathrooms sometimes consist of a hole in the floor. If there are toilets, flushing them involves dipping a bucket into a 55-gallon drum of dirty water and manually pouring it into the toilet bowl. Running water is a bonus, there is probably no heat, and you only get electricity for a couple of hours when someone turns on a generator. Once the power went out we passed the time playing cards by candlelight while drinking some surprisingly good Bolivian rum that we picked up for about $1 a bottle. The world is full of surprises. The next day we piled back into the Land Cruiser and headed even deeper into strangeness. An unexpected highlight for me was seeing all the flamingos. I have always associated flamingos with warm places like Miami, and the last place I expected to see them was in subfreezing temperatures at high altitude in the Andes. Yet they seem to do just fine here. My hat's off to them. Over the next couple of days we traveled through the most surreal landscape I have experienced in my life. More salt flats, strange rock formations, lakes of various colors, giant dunes of borax, geysers, bubbling cauldrons of mud, hot springs, and volcanoes. I could never quite shake the feeling that I was walking through a Salvador Dali painting. If I tried to describe it all you would be reading for hours, so instead I will just post a bunch of photos and leave the rest to your imagination! 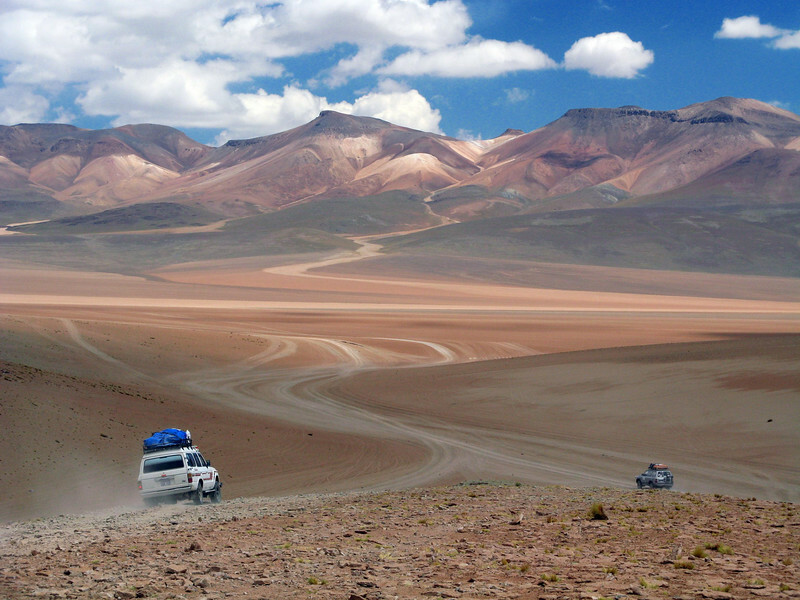 There are no roads high on the Bolivian plateau. Vehicles pick a spot and cross. 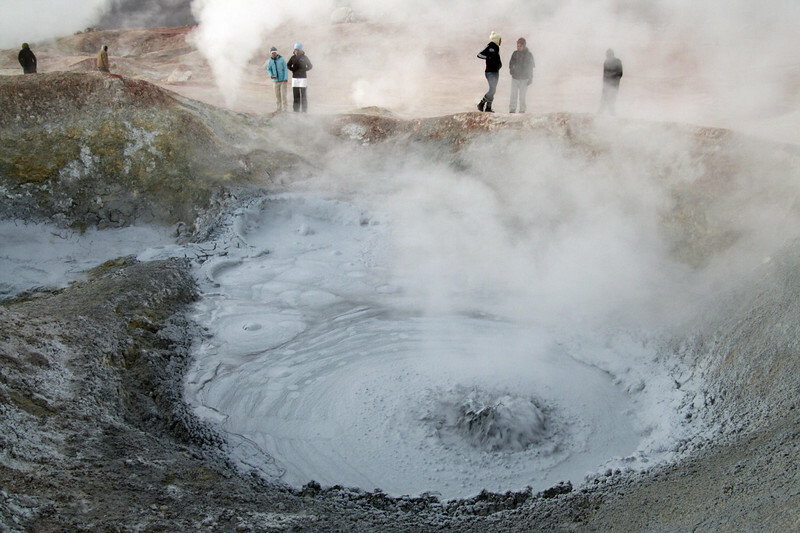 Bubbling cauldrons of mud and jets of steam really wake you up in the morning. 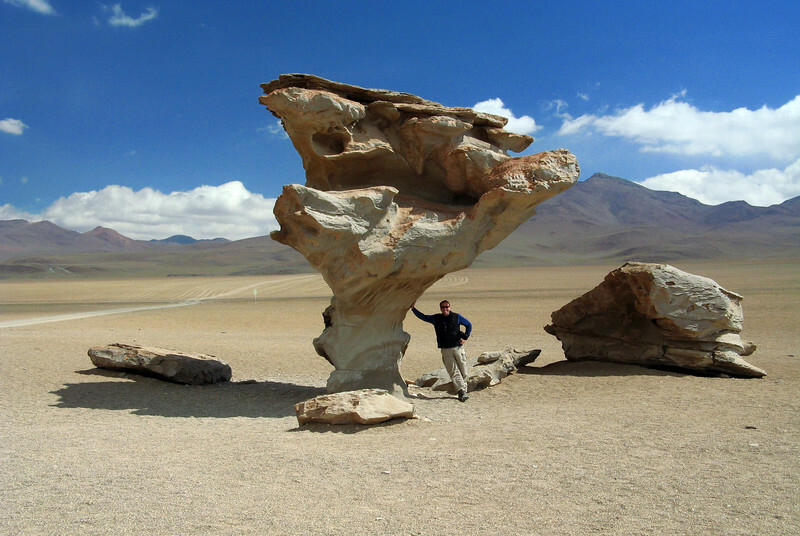 That's me standing under the 'Arbol de Piedra', or 'Tree of Stone'. 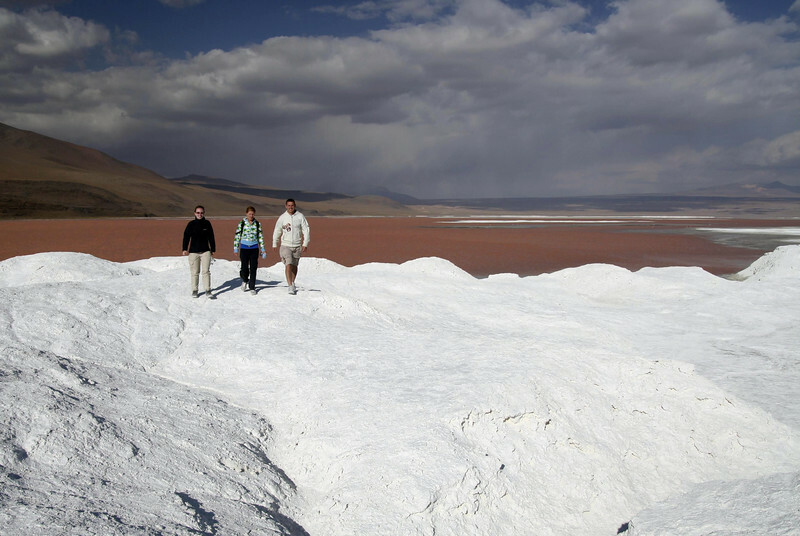 Where else can you walk on dunes of borax in front of an almost glowing red lake? The remote border crossing between Bolivia and Chile. 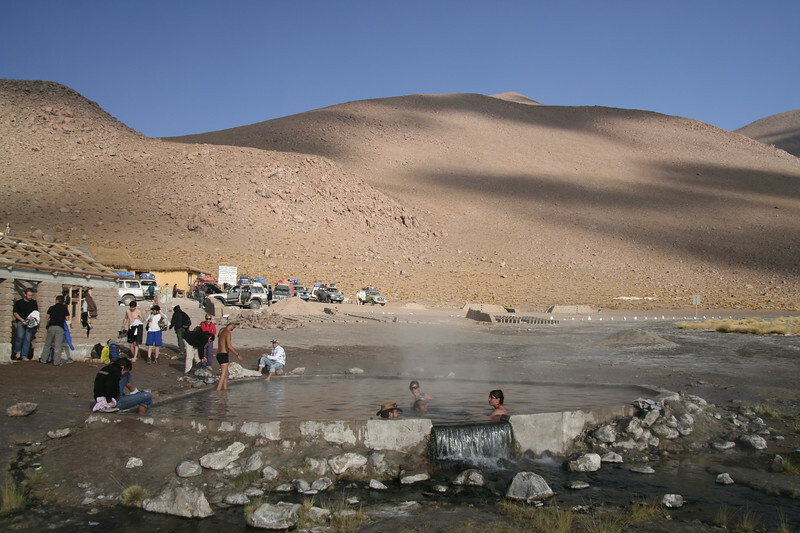 After three days crammed in a Land Cruiser, this hot springs at 4,200 m was most welcome!